Studies on the Carvaka/Lokayata (hereafter S-C/L) is a collection of 23 articles on various aspects of Carvaka/Lokayata (hereafter C/L) philosophy, written and published in several journals, mostly Indian, by Ramkrishna Bhattacharya during the last 15 years. This book not only represents the philosophical and cultural heritage received from Debiprasad Chattopadhyaya’s and Mrinal Kanti Gangopadhyaya’s works on Indian materialism – the scholars with whom Bhattacharya studied the C/L thought –, but it also sets out new perspectives, helping us to better define the import of C/L on Indian history of philosophy. To start with, it can be noticed that C/L, against the suppositions of Eric Frauwallner (History of Indian Philosophy, vol. II, p. 216) and other scholars, seems to have had a popular, not royal, origin (Ch. 1) as the very term lokayata bears witness to: lokesu ayatam, “widespread among the people”. It is nonetheless likely to think that at least some C/L perspectives at a certain point were accepted by kings and courtiers: some sources refer that the C/L were well versed in the knowledge of Arthasastras and Nitisastras, the treatises on the rules for a good administration. In any case, notwithstanding its “popularity”, only few fragments of C/L works have reached us as quotations inserted in writings belonging to non-C/L traditions (Buddhism, Jainism, Vedanta, etc. ); Ch. 6 presents and discusses the 18 C/L aphorisms, the 30 excerpts from C/L commentaries and the 20 stanzas which constitute all that we have at the moment of C/L original texts. However, as regards the stanzas, the majority of which are collected in Sayana-Madhava’s Sarvadarsanasamgraha, Bhattacharya affirms that (S-C/L, p. 217): «It is impossible to accept his [i.e., Sayana-Madhava’s] declaration that Brhaspati [the eponimous founder of Carvaka system] is the author of all these verses», some of them being apparently from Jaina works. Notwithstanding this paucity of material, from these fragments we are nonetheless able to outline the guidelines of C/L philosophy. (1) Only four elements are real (earth, water, fire, wind). (2) Perception is the principal means of right knowledge (pramana), whereas inference is accepted only if supported by perception (Ch. 4); the validity of the other means of right knowledge is rejected. In consequence of these two points, (3) the self (atman) as everlasting substance, (4) God as a being powerful in/on the world and (5) past and future lives depending on karmic retributions are not admitted (indeed they cannot be proved by means of the accepted pramanas). The non-acceptance of any supernatural power (God, karman, etc.) as intervening into human life makes the C/L found its ethical perspective totally on human effort (purusakara) and consequently deny the validity of the Vedic sacrifice. In Ch. 5 we find a list of five commentators of the Carvakasutras, the only five that we know by name: Aviddhakarna, Bhavivikta, Kambalasvatara, Purandara and Udbhata Bhatta. Among these philosophers, the sources refer to Purandara as a compiler of both a sutra and a commentary (vrtti); Purandara’s sutra-text has been commented in its turn by Aviddhakarna who compiled a work called Tattvatika, whereas Udbhata Bhatta wrote a commentary on the Carvakasutras called Tattvavrtti. All these philosophers flourished before the VIII century CE. If, thus, the VIII century CE can be considered as the period in which C/L reached its – so to speak – final form (with further developments up to the XII century), the origins of C/L philosophy can be traced back to at least the V century BCE, with Ajita Kesakambala, a senior contemporary of Gotama Buddha. Batthacharya shows that (Chs. II and III), even if it cannot be said with certainty that Kesakambala belonged to C/L tradition, from the accounts that we have on him it nonetheless appears quite clear that his philosophical perspective is to be regarded as at least a proto-Carvaka. This proto-Carvaka (and the subsequent C/L), founded on the theory of the existence of only four material elements represented just one school of materialism. Bhattacharya points out that other materialistic currents of thought were active in India. There existed for instance a school called of the bhutapancakavadins (those who believed in the existence of five elements), who added akasa, ether, to the admitted four material elements and who (S-C/L, p. 41): «are shown to be accidentalists (non-believers in causality) and hence inactivists, since human efforts are futile». Besides these distinctions among several materialistic streams, and as it occurs to all philosophies in themselves, also C/L presents internal doctrinal differences due to distinct lectures and interpretations of the basic sutra-texts, and to different conceptual directions assumed in dialectical disputations with other schools. The most important among these differences regards the nature of consciousness inferred from the interpretation of the C/L sutra: tebhyas caitanyam. According to the ancient thinkers (like Bhavivikta), consciousness originates from the mixture of material elements as the alcoholic degree originates from the mixture of juices, sugar, etc. Thus, tebhyas is to be intended in the ablative case: “from these, consciousness [originates]”. There is also a “modern” position (Udbhata Bhatta), which adumbrates some inclinations towards Nyaya and Vaisesika philosophies. According to this perspective, which interprets tebhyas as a dative, the sutra would mean “to these, consciousness [is manifested]”. In this second case, consciousness is seen as a material element, different from, but dependent on, the four basic elements (earth, water, fire, wind). Such internal dynamism is the clear signal of the deep interest that C/L had in finding adequate reasons for corroborating their fundamental ideas against the criticism of their opponents. This attentiveness towards logic and debate leads us to consider that C/L was not in primis a hedonistic school: as Ch. 9 shows, indeed, the half verse yavaj jivam sukham jivet («while life remains let a man live happily»), attributed to the C/L, induces to Hedonism only according to a misinterpretation; according to the context, indeed, the verse means that there is no bliss beyond this life, because beyond this life there is nothing, thus if one looks for happiness, s/he has to find it here and now. Moreover, as Jayantabhatta has pointed out, sukham jivet is not in itself a prescription, since all humans follow this in practice. From Ch. 11 up to Ch. 15, Bhattacharya examines several texts dealing with C/L. In Ch. 11 we find an analysis of Santaraksita’s Tattvasamgraha 22.1856-1870 and Kamalasila’s Panjika thereon, which provide us with (S-C/L, p. 145): «(a) the names of three Carvaka philosophers, Aviddhakarna, Kambalasvatara and Purandara, (b) some extracts from their works, (c) the name of Aviddhakarna’s commentary [i.e., Tattvatika], and (d) no fewer than eleven fragments from the Carvaka- or Purandara-sutra». The fragments are collected in the abovementioned Ch. 6. In Ch. 13 a passage of Udayana’s Nyayakusumanjali: lokavyavaharasiddha iti carvakah, is explained on the basis of textual and philosophical evidences. Bhattacharya argues that (S-C/L, p. 160-161): «Udayana intends to suggest that the Carvaka-s make God out of their insistence on perception: whatever is not and cannot be perceived in this world is rejected by them». Thus, it can be underlined that according to Bhattacharya these – Santaraksita, Kamalasila and Udayana’s excerpts – are good sources for the study of C/L. In Ch. 12 the representation of the Carvaka in Jayantabhatta’s Nyayamanjari is considered; Bhattacarya concludes that Jayantabhatta, who in several places falls in contradiction for instance on the C/L doctrine of pramanas (S-C/L. p. 149-150), «in his polemics against the Carvaka-s does not help us to reconstruct the basic tenets of ancient Indian materialism, On the contrary, he has misrepresented the Carvaka view on inference» (S-C/L, p. 156). We find a similar conclusion of unreliability in Ch. 14, dealing with Hemacandra’s treatment of C/L. Also Hemacandra seems to have misunderstood the real import of C/L philosophy as Bhattacharya notices to us (S-C/L, p. 172): «Hemacandra’s stray remarks and comments on the Carvaka do not help us much in reconstructing the Carvaka system of philosophy […]. What is transparent is Hemacandra’s all-out antipathy to the materialist system». It appears that the aim of these two authors was not to expound the C/L doctrines, rather primarily to deride them; therefore, for extracting the reliable information contained in their texts, philosophical forcings and inaccurate references have to be detected. Bhattacharya here, as elsewhere in this book, demonstrates to have been able to carry acutely out this task. In Ch. 15 Haribhadra’s Saddarsanasamuccaya is considered, particularly the parable of the wolf’s footprint as representative of the criticism of the belief in supernatural things (soul, gods, heaven, hell, etc.). Then, three Chs. (16, 17, 18) on the meaning of the term lokayata follow, to which we can add also Ch. 10, where the significance of lokayata in Kautilya’s Arthasastra is pointed out. From all these studies it appears that lokayata originally meant nothing but «disputation», «dialectics», etc, and not materialism. In Pali and Buddhist Sanskrit, for instance, lokayatika brahmana is used to refer to (S-C/L, p. 191): «one who is fond of disputation, hence criticized as one engaged in sophistry or casuistry». Hence, we have to conclude, with Bhattacharya, that (S-C/L, p. 195) «Only later, but no much earlier than the fourth century CE, lokayata came to mean materialism […]. What was common to the older Lokayata-s and the new Carvaka materialists was perhaps disputatiousness: nothing was sacred to them». Chs. 19-21 deal with three passages from the Carvaka chapter of Sayana-Madhava’s Sarvadarsanasamgraha. It is interesting to note here how in Ch. 19 Bhattacharya demonstrates that the half stanza yavaj jivam sukham jivet rnam krtva ghrtam pibet («while life remains let a man live happily let him feed on ghee even though he runs in debt») has been concocted by Sayana-Madhava probably for decrying C/L thought, the original version attested by other sources (and by Sayana-Madhava himself in a previous passage!) being yavaj jivam sukham jivet nasti mrtyor agocarah («while life remains let a man live happily; nothing is beyond death»). In Ch. 21 Bhattacharya suggests that at least one verse among those quoted by Sayana-Madhava and ascribed by him to Carvakas has to be considered as taken from Jain sources. This is another case in which Bhattacharya’s sharp textual and philosophical analysis detects and unravels several problematic points, unnoticed by other scholars. With these chapters on Sayana-Madhava’s Sarvadarsanasamgraha, Bhattacharya sheds light on the peculiar attitude of this medieval thinker towards C/L, that is, an apparent tension between the objective need of describing the C/L philosophy and the subjective inclination to discredit it. Ch. 22 represents something new in the panorama of the studies on C/L, because it deals with the Perso-Arabic sources. Bhatthacharya here analyses the following texts: al-Biruni’s India, al-Shahrastani’s Ara’ahl al-Hind, Abu’l Fadl-i-Allami’s Acin-i Akbari. In the last chapter of the book, which deals with the usage of the term nastika («negationist») in Vatsyayana’s Nyayasutrabhasya, it emerges that Vatsyayana makes use this word for indicating both an absolute idealist who denies the reality of things, and a materialist who denies the validity of every imperceptible thing (as the atman, etc.). This, indirectly, should lead us to be cautious in interpreting the term nastika as referring undoubtedly to C/L, when it occurs in other contexts too. Let us take for instance into consideration Manusmrti 2.11, where the nastika is said to be a twice-born dialectician. Kullukabhatta, who comments in his Manvarthamuktavali this word by referring to Carvaka, seems to be completely wide of the mark because here the description of the nastika reminds us the abovementioned lokayatika brahmana of the Buddhist sources and by no means a C/L materialist. To conclude, in his S-C/L Ramkrishna Bhattacharya examines an incredible number of sources, that speak, deal with or refer to C/L, with a critical disposition and a thorough attention, in this way restoring as far as possible the actual philosophical, historical and cultural horizon of this, now less lost, Indian tradition. For these reasons, this book is, and will be, an important milestone in the studies on C/L. 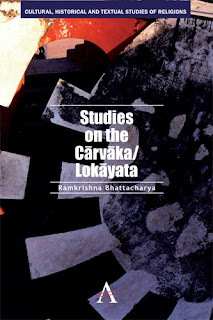 Book Review: Ramkrishna Bhattacharya, Studies on the Carvaka/Lokayata, Società Editrice Fiorentina, Firenze 2009; Indian edition: Anthem Press India, New Delhi 2012. Dr KrishnaDel Toso was an Instructor in Philosophy of Religion at the Faculty of Scienze della Formazione, University of Trieste. At present he collaborates with the teaching of Theoretical Philosophy, Dept. of Humanities, University of Trieste.